What is the deal with Chicago's ginormous 16-inch softballs? For scale, the size of a 16-inch softball. It really is nearly the size of a cantaloupe. 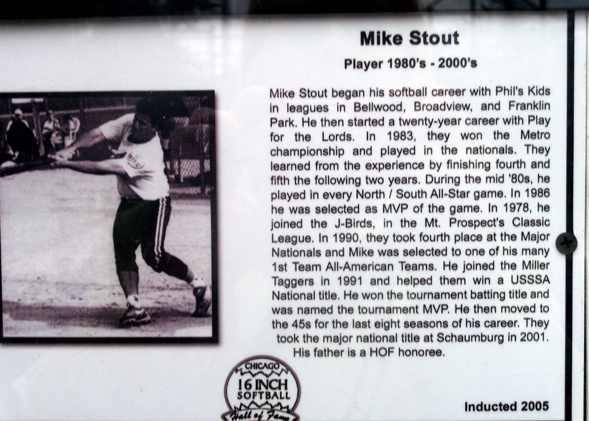 Cheryl Raye-Stout's brother in law Mike's Hall of Fame plaque. 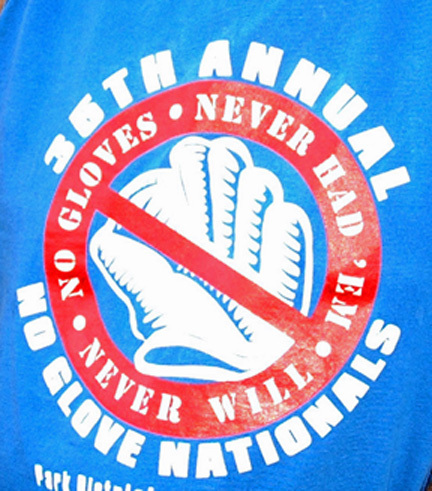 2012 marks the 45th year of the No Glove Nationals. The outdoor set up at the site near the Hall of Fame. 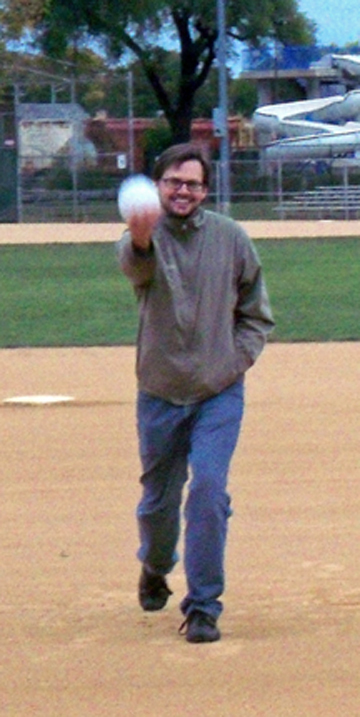 Curious citizen Derek Stiles tries his first pitch with a 16-inch softball. What is the deal with Chicago&apos;s ginormous 16-inch softballs? Derek is a transplant from San Diego and had played softball in Iowa City, Iowa, before coming here. His Iowan games involved a smaller ball and players used gloves, but he noticed something different when he tried picking up games in Chicago. He had begun looking to play for a softball team and a league here, but his family grew by two (twins!) so he did not resume his playing days on the field. 16-inch softball is the norm in Chicago so sometimes it’s easy to forget that it’s not the norm elsewhere. If you were born and raised here, it would seem like an odd question, but that’s a bit myopic. We basically are 16-inch softball snobs, but it is our game and investigating Derek’s question was a fun game in itself! When the question was posed to me and I was given the quest to pursue it, little did the Curious City staff know that I had some connections to this game. I grew up in Chicago’s Austin area in the ‘60s and ‘70s, and 16-inch softball was the norm for me, especially with alleys, small playgrounds and small backyards. That was the case throughout Chicago and the suburbs. You would find people playing in leagues from Rogers Park to Hyde Park, from Lakeview to Belmont-Cragin, and from Mt. Prospect to Forest Park; teams and leagues were formed and played in most neighborhoods. We kept our bat and ball by the front door during softball season (no gloves, of course). It seemed nearly everyone had leagues: factories, various companies, churches and schools. In the ‘80s, I played in the Chicago Theatre Co-ed Softball League. For those of us born and raised in the Chicago area, this particular softball game ― 16-inch ― seemed to be a way of life. This investigation was intriguing to me since we played with that big ball and suffered the injured fingers it can cause. I need to know why for myself! The size of the ball has a very old history that goes back to 1887. This is where the investigation began, since the history of 16-inch softball would give us clues about the ball and why it’s bigger than its 12- and 14-inch cousins. This is where my connections came through; my husband’s family is entrenched with the game and the 16 Inch Softball Hall of Fame. In a matter of minutes my husband Glenn had the emails of several members of the Hall. The first was co-founder of the Hall of Fame, Al Maag, who is also the Hall’s historian. He was able to fill me in with several of the details about the game that, until now, I have never heard about. The Hall of Fame also has a comprehensive website that details much of the game’s history. As it exists now, the game is supposed to have broad appeal, so it was interesting to find that the game was actually begun by members of our country’s academic elite. On Thanksgiving Day 1887 at the Farragut Boat club, a group of Harvard and Yale alumni were waiting for results of their schools’ annual football game to arrive via ticker tape. As they were sitting around, wrapped up a boxing glove and and used a broomstick as a bat. They came up with rules similar to baseball and continued to play the game indoors. The game was played at indoor venues such as armories, but eventually it made its way outdoors. What made this game so popular in Chicago? Unlike baseball, a softball — particularly a 16-inch one — doesn’t travel too far when hit, at least not easily. That fact was important since the game could be played in smaller quarters than baseball and, hence, in more locations. Another big factor was the game’s lower cost. You see, all you needed was the ball and a bat … no gloves. The ball’s 16-inch softball precludes the use of a glove and that makes the game more cost effective. During the Depression the game became popular because it could be played in many places and a team could buy a ball for a dime. Also, women played the game because they felt it was safer than baseball. Over the years, the game became a great sports outlet for Chicagoans and became part of the culture. The decade of the ‘50s was the game’s so-called "Golden Age"; it was so popular that teams had their own stadiums and could charge admission to the thousands of spectators who filled the stands. One of the era’s notable players, Bill "Moose" Skowron, went on to become a famous New York Yankee. At a recent golf tournament for the Hall of Fame held in suburban Lemont, several former players and umps spoke to me about the game they’ve been so passionate about. Some began playing softball during the 50’s, others during the following decades. For them, 16-inch softball was a common theme and a huge part of their lives; in fact, some believed they spent more time with teammates on the field than they did with their families. (Believe me when I say they were not apologetic about it.) Larry Pickard from the Park District of Forest Park wore a shirt that had the phrase "No Gloves-never have-never will." 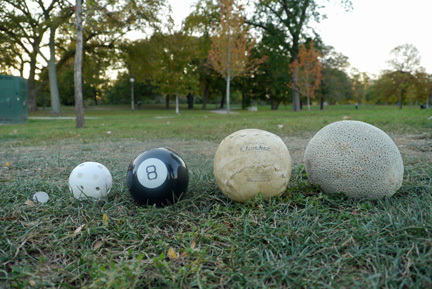 Curious City Senior Producer Jennifer Brandel gets to the heart of the matter of the “Clincher” ball, the staple of the game. Jennifer interviewed Rawlings-Worth-DeBeers spokesperson John Parish about the history and the materials that make up that ginormous ball. The materials of the DeBeers “Clincher” have evolved but are basically the same from its original form. The cover material of the 16-inch softball was made of horse hide until the 1990s. Since then, horsehide became scarce and the company developed a synthetic cover for the ball. The inside of the ball is fascinating and explains how the 16-inch softball performs. The core is made of kapok, a fiber used to make life preservers and life jackets, as well as the key to how the ball reacts when it’s hit. A brand-new “Clincher” ball is hard, meaning that when it’s first used in a game the ball travels. But as the game progresses, the ball softens up and it won’t fly as far. In other words, the change in the ball’s texture directly affects the offense. John Parish said that, though vast majority of the company’s sales of that ball are here, the DeBeers “Clincher” is not totally exclusive to Chicago; they do sell the ball in Wisconsin, Iowa, Arizona and California. John believes those are former Chicagoans making the purchases and, according to Al Maag, he’s likely right. Al says he knows of Chicago transplants playing the game in those places as well as Indiana, Oregon and Pittsburgh. Not only does the 16 Inch Softball Hall of Fame exist, there is a real tangible building in Forest Park for a future museum. This is where Derek and I were able to meet and I could show him the “seriousness” of this sport. While many people play it recreationally, there are a huge number of people that play in the “majors” of softball. And, yes, there is a “majors” and the players are in hard-core leagues. Teams such as Lettuce, Bobcats, Miller 45’s, Splinters, Smoke, Windy City and Licorice were/are well-known in softball circles. These teams compete in leagues that were once considered legendary. It’s true that 16-inch softball may not have such status now, but teams are still very competitive. These teams play several days a week, they play for years, and the best of them get inducted into the 16 Inch Hall of Fame, which Al Maag and Tony Reibel founded just over twenty years ago. They have honored players (including women) from the early roots of the game until the present, and inductees have run the gamut from ordinary players to umpires, managers and members of the media. The most notable of the media are the late, great columnist Mike Royko and late sportscaster Tim Wiegel. Derek also learned that this game is so serious that there is a weekly softball radio show hosted by Hall of Famer Tim Maher. Renovations of the Hall in Forest Park are happening at the corner of Harrison and Des Plaines. The Hall purchased the building from the village’s park district for a dollar. Organizers expect the outside of the building to be complete within a few weeks and that the inside will be prepared for viewing soon. Successful fundraising efforts have been ongoing. 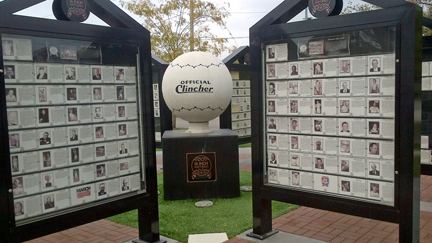 Just a few feet away, “Inductee Park” has several cases that display photos and tell stories of the Hall’s inductees. This is where my connection comes into play. As mentioned earlier, my husband was helpful with contacts: My brother-in-law Mike Stout is in the Hall as a player and my father-in-law, Jack Stout, shot photographs for the Hall throughout the years. Jack’s honor is known as the Fred Holan “Friend of the Game” Award. Jack shot video and took pictures at games and Hall dinners, even when his sons were not playing. He did it because he loved it. While the 16 Inch Hall of Fame building and displays represent the game’s past, they’re adjacent to a softball field that’s useful and viable in the present. The Forest Park playing fields are pristine and cared for by the Park District. Even during a visit in October, Derek and I found a softball game was on the schedule. Not 16-inch but a co-ed 14-inch game (complete with gloves). The Forest Park 16-inch softball league features twelve teams that play from April to August. Grace Kenney, who runs the softball leagues for the Park District, told me the average player in the 16-inch league is over the age of 30. There were two teams added this year. Before that scheduled softball game, I brought a gift for Derek: a brand-spanking new DeBeers “Clincher” 16-inch softball. I figured he had to have one and the field was empty and the opportunity was there for him. He opened the box and took off the cellophane wrapper and put it in his hand. “How do you hold it?” he asked. I told him you wrap your hand around it. We went onto the field and walked to the pitcher’s spot (there is no real mound in softball) and he pitched a “Clincher” for the first time. Derek had only played the outfield — with gloves — in Iowa. I didn’t have a bat so we didn’t take any swings, but Derek got the ball over the plate. He also learned that you can’t catch it with one hand — it’s two hands all the way and … no gloves!